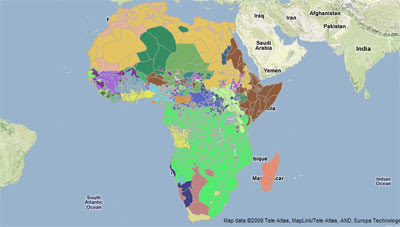 Here’s a great tool for geography study of Africa. AfricaMap is based on the Harvard University Geospatial Infrastructure (HUG) platform, and was developed by the Center for Geographic Analysis to make spatial data on Africa easier for researchers to discover and explore. It’s an interactive tool. You can capture images (another add-on might be necessary) — but look at all the different layers you can use, live, on your computer. Good source for student projects, no? Tip of the old scrub brush to Google Maps Mania. Any visitor to Thomas Jefferson’s home at Monticello knows of Jefferson’s wide-ranging interests, and work in science and invention. I was rather surprised to discover the depth of George Washington’s inventive work, in a seminar sponsorred by the Bill of Rights Institute at Mount Vernon a few years ago. Lincoln lived along the Sangamon River, and he saw development of the river for commercial navigation to be a boon for his district’s economic growth. Unfortunately, the Sangamon is not deep; boats had difficult times navigating over the many logs and snags, and shallows. Earth and Sky reminds us that tonight is a good chance to see Comet Lulin, if you can see it at all from where you are. Comet Lulin probably won’t be high enough in the east for decent viewing until 8:30 or 9:00 p.m. Later at night is even better. At mid-evening, two respectively bright starlike points of light bedeck the eastern sky. The higher of these two lights is the star Regulus, the brightest star in the constellation Leo the Lion. Saturn is to the lower left of Regulus, its golden color contrasting to that of sparkling blue-white Regulus. If you can’t distinguish their colors with the unaided eye, try looking at Saturn and Regulus with binoculars. Comet Lulin and Saturn will remain within each other’s vicinity all night long, until morning dawn finally washes them from the sky. Look for Comet Lulin and Saturn to swing highest up for the night around 1 a.m. on February 24, at which time they’ll be due south. If you’re up before dawn on February 24, look for Comet Lulin and Saturn in your western sky. Astronomers believe this is Comet Lulin’s first trip into the inner solar system. There’s always an element of unpredictability associated with comets, especially a pristine comet like Comet Lulin. 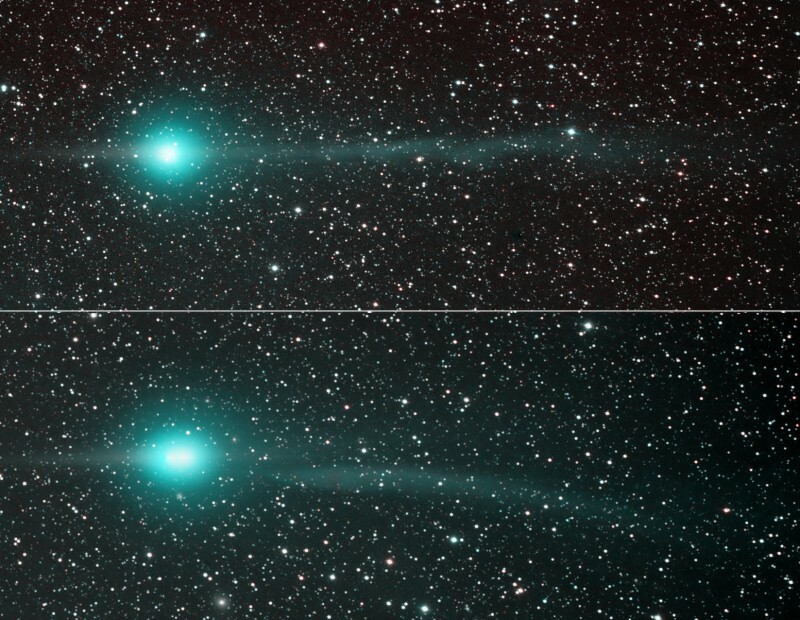 Comet Lulin may match, exceed or fall short of expectations, but there is no way to know for sure unless you look! If you miss Comet Lulin by Saturn on February 23-24, try again on the night of February 27-28, when Comet Lulin will cozy up with Regulus! I understand t The comet’s discoverer is a school boy 19-year-old university student in China, who found the comet in photos taken at Taiwan’s Lulin Observatory (usually comets are named after their discoverer, but not this time). Way to go, amateur astronomers! Way to go, cooperation between Taiwan and the People’s Republic of China. 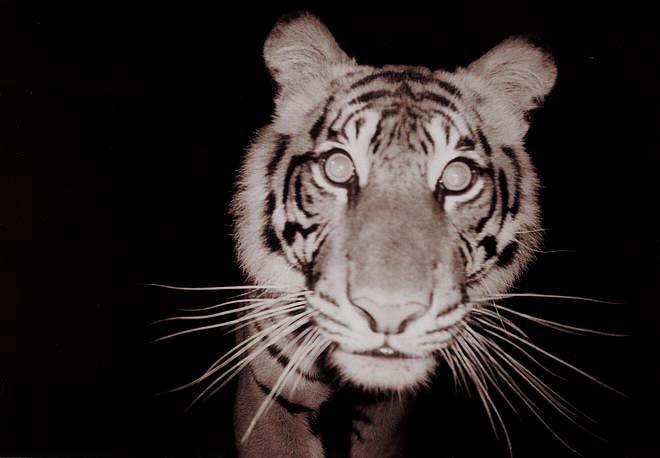 Wild Sumatran tiger - "Face on with wild tiger in Sumatra. This animal didn't like camera traps and destroyed three over a weekend." Photo by Michael Lowe, 2006, Wikimedia Commons. See William Blake's poem, below. On Sunday, a tiger attacked and killed a man carrying logs near an illegal logging camp, Wurjanto said. Two other loggers in the same area were mauled and killed on Saturday. Preliminary findings suggested the attacks were taking place because people were disturbing the habitat of the tigers, Wurjanto said. The Sumatran tiger is the most critically endangered of the world’s tiger subspecies. Forest clearances, killings due to human-tiger conflict, and illegal hunting for the trade in their parts, have led to tiger numbers halving to an estimated 400-500 on the Indonesian island from an estimated 1,000 in the 1970s, conservationists said. Under Texas law, a homeowner may use deadly force to stop trespassers, especially someone who poses a threat to the homeowner and the property. I wonder whether the tigers will even get a trial. A tree poacher mauled to death by the endangered tigers whose habitat he destroys: Perfect example of poetic justice. Burnt the fire in thine eyes? And what shoulder, and what art? What dread hand, and what dread feet? Did he who made the Lamb, make thee? Four Stone Hearth #60 is up, hosted by Middle Savagery. Yes, I know, I’ve been remiss in carnivalling lately. Heck, I’ve been remiss in posting. The water in the Bathtub is actually too cold for bathing at the moment, as I’m away metaphorically, working on serious curriculum matters. So, it’s a good time to take a look at something like the best archaeology blog carnival around. It’s up to edition Number 60? Great news, really, that there is so much material to cover. There is some delightful morsel in every edition. FSH #60 is heavy on photos — grist for your better slide presentations, no? 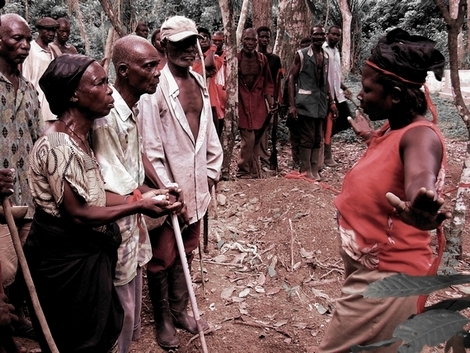 A few almost-award-winning photos of modern Africa from Ideophone — I’ll wager the photo of the woman channeling the dead hunter, to his family and cowering hunting companions, could provoke serious discussion about religions and beliefs in the world today. Testimony of the Spade features images from the first book on archaeology in Sweden, a 1675 tome. And you thought your textbooks were dated! Zenobia, Empress of the East looks at a project that used lasers to scan a bas relief on a rock in the 3rd century A.D. Parthian empire — er, maybe Persian — but wait! Is that Greek influence in that carving? This extraordinary relief is carved on a huge limestone boulder at the cliff edge of a remote, not to say ‘hidden’ valley in the rugged mountains of northeastern Khuzistan [at the southwestern edge of the Iranian plateau, sharing a border with southern Iraq (= the big red blob on the map, below right)]. In ancient times, this was the heartland of Elymais, sometimes a small empire, more often a vassal to more powerful states. 21st century technology and science applied to help solve a 700-year-old mystery. Does archaeology get much better than that? Especially if you’re inclined to study Neanderthals, or for a great sidebar on the value of biodiveristy, take a look at Remote Central’s post on the last stand of Neanderthal, on Gibralter. There is much more in Four Stone Hearth #60. I had work to do, and I missed it. America’s living-room astrophysicist Neil deGrasse Tyson came to Texas. Last Tuesday he spent a day trying to inspire college kids to study physics, or to stick with physics, and then he spent the evening with 3,000 close friends in an auditorium at the University of Texas-Arlington, talking about how much fun physics is, and how the use of real science and reason could improve our lives. About using math illiteracy to distort truth, Tyson said he was called for jury duty and the defendant was charged with possession of 6,000 milligrams of a controlled substance. Great scientific discoveries have not come about because people are interested in science, Tyson said. Just like the voyage of Columbus, funded by Queen Isabella of Spain, discovery is spurred by wars, cold wars and economic gain, he said. The only other inspiration for counties to spend lots of money is to celebrate royalty or deities, like with the Pyramids or the great cathedrals in Italy. “We live in a country where people are afraid of the number 13. It’s delusional,” Tyson said, pointing to a book titled, “How to Protect Yourself from Alien Invasion” and the hysteria a few years ago with the Mars Hoax, with lots of science fiction circulating because Mars came closer to Earth than it had in 60,000 years. The widely circulated reports overlooked the fact that Mars was just a few inches closer and that was completely insignificant, Tyson said. During the Q&A, an audience member asked Tyson about conservative members of the state Board of Education who want to teach the “weaknesses” of the theory of evolution in Texas high school classrooms. “I think they should stay in the Sunday school,” Tyson said. Calling intelligent design theory a “philosophy of ignorance,” he argued that a lack of appreciation for basic scienctific principles will hurt America’s scientific output, which has been the largest economic engine in the country’s history. “If nonscience works its way into the science classroom, it marks…the beginning of the end of the economic strength this country has known,” Tyson said. Tyson, who spent time in Washington, D.C. after being appointed to committees by then-President George W. Bush, went on to say that he always knew a Republican judge in Pennsylvania would ultimately side with evolution backers in the high-profile Dover education case in 2005. The judge understood that respecting science is good for the US economy, Tyson said. “What I learned from my tours of duty in Washington is no Republican wants to die poor,” Tyson said. He’s right about Republicans ( said the former employee of Orrin Hatch/William Bennett/Lamar Alexander). I hope it’s true for Texas Republicans, especially those on the Texas State Board of Education. Tip of the old scrub brush to Ediacaran, on the Fort Worth side of the Metroplex. Another tip to Physics Today from the American Institute of Physics. You can go read this at P. Z. Myers’s Pharyngula, but I’m going to pirate most of his post here to reiterate the point for Texas: Intelligent design doesn’t belong in Texas science classrooms, and intelligent design’s attacks on evolution don’t belong there either, because they are not backed by science. ID’s propaganda tank, the Discovery Institute, invited a biologist from the University of Vermont, Nicholas Gotelli, to debate one of their spokesmen. The biologist declined. Unable to perform in science venues, the Discovery Institute is working to get Texas high school students to take Dr. Gotelli’s place. That’s why Texas scientists and educators are up in arms against the proposals from the Texas State Board of Education — Texas high school kids cannot do the work of science, and shouldn’t be called on to be the patsy for the Discovery Institute in classrooms, for grades. Here’s the invitation; be sure to read Dr. Gotelli’s response, further below. I saw your op-ed in the Burlington Free Press and appreciated your support of free speech at UVM. In light of that, I wonder if you would be open to finding a way to provide a campus forum for a debate about evolutionary science and intelligent design. The Discovery Institute, where I work, has a local sponsor in Burlington who is enthusiastic to find a way to make this happen. But we need a partner on campus. If not the biology department, then perhaps you can suggest an alternative. Ben Stein may not be the best person to single-handedly represent the ID side. As you’re aware, he’s known mainly as an entertainer. A more appropriate alternative or addition might be our senior fellows David Berlinski or Stephen Meyer, respectively a mathematician and a philosopher of science. I’ll copy links to their bios below. Wherever one comes down in the Darwin debate, I think we can all agree that it is healthy for students to be exposed to different views–in precisely the spirit of inviting controversial speakers to campus, as you write in your op-ed. I’m hoping that you would be willing to give a critique of ID at such an event, and participate in the debate in whatever role you feel comfortable with. On the other hand, Dr. Belinski may be a good choice since he is a critic of both ID and Darwinian theory. Would it be possible for us to talk more about this by phone sometime soon? However, this kind of two-faced dishonesty is what the scientific community has come to expect from the creationists. Academic debate on controversial topics is fine, but those topics need to have a basis in reality. I would not invite a creationist to a debate on campus for the same reason that I would not invite an alchemist, a flat-earther, an astrologer, a psychic, or a Holocaust revisionist. These ideas have no scientific support, and that is why they have all been discarded by credible scholars. Creationism is in the same category. Instead of spending time on public debates, why aren’t members of your institute publishing their ideas in prominent peer-reviewed journals such as Science, Nature, or the Proceedings of the National Academy of Sciences? If you want to be taken seriously by scientists and scholars, this is where you need to publish. Academic publishing is an intellectual free market, where ideas that have credible empirical support are carefully and thoroughly explored. Nothing could possibly be more exciting and electrifying to biology than scientific disproof of evolutionary theory or scientific proof of the existence of a god. That would be Nobel Prize winning work, and it would be eagerly published by any of the prominent mainstream journals. “Conspiracy” is the predictable response by Ben Stein and the frustrated creationists. But conspiracy theories are a joke, because science places a high premium on intellectual honesty and on new empirical studies that overturn previously established principles. Creationism doesn’t live up to these standards, so its proponents are relegated to the sidelines, publishing in books, blogs, websites, and obscure journals that don’t maintain scientific standards. institute must scrape around, panhandling for a seminar invitation at a little university in northern New England? Practicing scientists receive frequent invitations to speak in science departments around the world, often on controversial and novel topics. If creationists actually published some legitimate science, they would receive such invitations as well. So, I hope you understand why I am declining your offer. I will wait patiently to read about the work of creationists in the pages of Nature and Science. But until it appears there, it isn’t science and doesn’t merit an invitation. In closing, I do want to thank you sincerely for this invitation and for your posting on the Discovery Institute Website. As an evolutionary biologist, I can’t tell you what a badge of honor this is. My colleagues will be envious. P.S. I hope you will forgive me if I do not respond to any further e-mails from you or from the Discovery Institute. This has been entertaining, but it interferes with my research and teaching. Of course, that’s what Judge William Overton told creationists to do way back in 1982, in the Arkansas trial. Just do the science, and it will be in the textbooks as if by magic. If creationists won’t listen to a federal judge, why would they listen to Vermont biologist? You are currently browsing the Millard Fillmore's Bathtub blog archives for February, 2009.